How is it that so many find joy in decluttering? For some time now it has been on my heart to let go of the many things I own and enjoy the freedom that accompanies owning less. I’ve read books and articles, watched TV shows and know ‘how ‘to do it. Yet the actual process leave me smiling and deciding that ‘this’ doesn’t need to go. Those smiles later lead to frustration. When I first finished college and moved to Zimbabwe, I went with two suitcases. A small crate followed but with only a few necessities. Four years later, married to Mark, I returned to the US with two suitcases and no crate. Life was good. Then Mark got the job with Chiquita and it all began. The company moved us on average every two years. With each move came a promotion and a bigger company house. The professional movers arrived and packed every single item, down to the crumbs, toothpicks and dust in the kitchen drawers. Often there would still be unpacked boxes when we were transferred once again. I loved each place we lived and collected memorabilia, each with a meaning. So now, having returned to the US and having artifacts from all over the world, I am left with the task of getting rid of my stuff, in the hopes that one man’s cast offs (not junk) is another man’s treasure. Yet, it is proving itself an extremely difficult task. There is the carved statue of a bananero (banana worker). I loved the years we spent on the banana plantations in Panama and Honduras. I can visualize driving on roads with hector after hector of banana trees on either side. There would be the odd worker with his machete chopping away the growth from the soil around the trees and the hands of bananas could be seen on the pulleys carrying them to the washing station to be cleaned and packed into boxes ready for exportation. The crop dusters would sweep down, spraying insecticides, and then ascend into the sky to repeat their task once again. ; always reminding me of a pilot’s playground. My children were small and life was simple. Those were good days. I think I will keep my bananero. Then there is the large driftwood carving that I bought before we left Mozambique. Colin had just been released home from the hospital having spent five days critically ill with malaria. It was Christmas Eve and we had bought no presents as our life had been turned upside down with Mark loosing his job and Colin so ill. Mark’s father had just died and his mom was with us. We had to make Christmas special for her and for our three teenagers, even though no one felt like celebrating. That statue represents our short five months in Mozambique and God how healed Colin’s physical body and Mark’s soul. No, I cannot get rid of that! There is the carved, black ‘La Negrita” from Costa Rica. My sister had visited me and we drove up to Cartargo to see the ancient cathedral where people walked in pilgramage every year to be healed by the small black statue of Mary (hence the name La Negrita). Afterwards we drove a few kilometers up windy hills to sit in hot springs that supposedly contained healing powers. We floated in the pools and chatted with people regarding their illnesses that they were praying would miraculously disappear. Then we had to laugh as we realized we were sitting in almost stagnant pools with some who most likely had contagious diseases. We would now need a trip back to the cathedral! How can I throw away a fun memory like that? I could get rid of my blue pottery. But my mom bought that in Malawi when I was a child. When she downsized she gave it to me. There are a few pieces cracked or glued together. But the memories! I remember spending Christmas one year in a tent on the beach of Lake Malawi. Our whole family were reading one afternoon when we saw a snake slither among the few presents under our three foot Christmas tree. Yes, my mom brought a small tree to make Christmas special since we were away from home. We could barely fit four people in the tent but we had to have that tree! The snake was a black mamba. If one is bitten by a mamba they are given about eight minutes to live if they do not get to the hospital in time to receive the anti venom injection. No, I will keep the pottery because with the pottery comes a memory of that Christmas in Malawi. 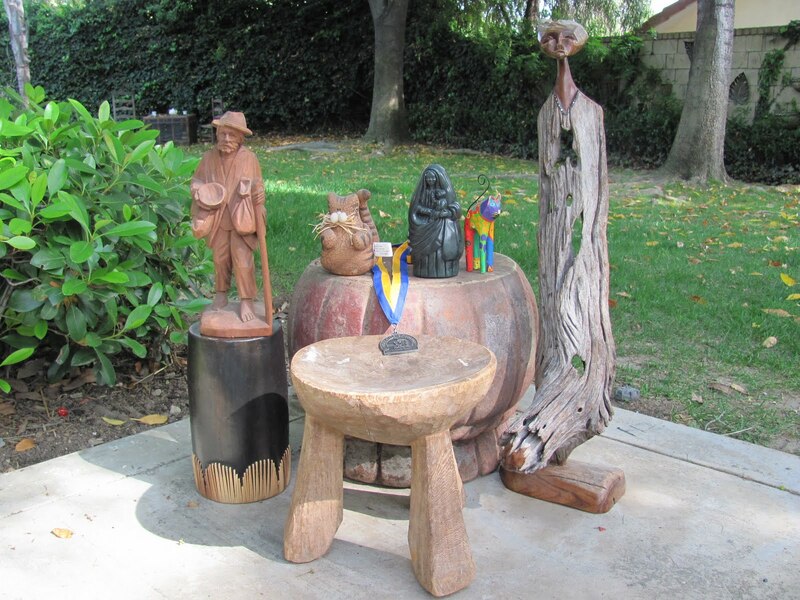 There is the chief stool from a Zambia village. Oh the memories! Driving forever on rough bush roads, crossing bridges made of logs and sticks, to arrive at the villages for worship services, After dutifully greeting the people, my sister and I would case the chickens and pigs, hold the babies and play with the other children as we waited for those walking from neighboring villages to arrive. Then we would all sit to begin our service, sometimes under a tree. The women would sit on one side, the men on another, with an invisible line dividing us. We would sit, legs outstretched in front of us on the red dust of the Savannah plains. Then my dad would be given the chief stool and he would sit in front of us all with a couple of the church leaders. There would be a small handmade table on which was a plate of crackers and a cup of juice for communion. This was always covered carefully with a crochet cloth. As we worshipped the occasional chicken or pig would wander through the crowd, unnoticed by all except our family. No! The chief stool will stay. And what about the carved cats my children so thoughtfully chose for me over the years as birthday and Christmas gifts? They were so young and precious and took such joy in choosing just the right figurine to add to my collection. And the boxes of running logs, race results and marathon medals! I worked so hard to qualify for Boston and flew from Costa Rica with a few of my buddies to run the most exciting marathon of my life. That medal at least has to stay! Going through my stuff only leaves me reminiscing of days gone by. The decision to declutter is not working very well. I could go on and on with the stories in my head. If I throw away these ‘things’ I might lose my precious memories with them. It is not necessarily the item I am loosing but the stories they represent. Maybe I will take photos of all my stuff and write the story behind each item. In the long run, my family might appreciate that even more than me leaving them something that they will eventually put in a garage sale when I die. And, in reality, my memories are mine. They will always be with me. The things are not important. No one else finds the same joy as I do in these things. I think I have found my solution. I will take a photos, put my memory on paper, and kiss the item goodbye. Well, not all of them. But I will try! This entry was posted in Africa, childhood, decluttering, memories. Bookmark the permalink. >I see you've started thinking about my decluttering post from last week! I never said it wasn't hard (especially for the savers)!!! Best wishes as you sort through your possessions. A scrapbook/journal with your memories written down sounds like an excellent starting point. >Shanda, so beautiful! I know I couldn't part with that kind of stuff. I'm so sentimental. What beautiful memories and I love how eloquently you described each of them. I feel like I was there and I don't want you to get rid of all your cool mementos. When you write, I can hear you speaking it, just as if you were talking to me face to face. Is that weird or what!? BTW, we have a cat figurine collection too!!! >I've been there and still am on this simplifying journey. Small steps is the answer…one doable project at a time! Thanks for visiting my blog so I could find yours. >Thanks for stopping by my blog. I've very much enjoyed my visit to yours, and will be back soon to read some more. I loved this post and vicariously living through some of those beautiful memories with you.